This bottle was found buried in our basement sand and was found during renovations we are currently having there. Actually there were lots of interesting bottles, some broken china and - a some sort of missile from the war. Thankfully it didn't detonate :) So I had this idea to make this old bottle, which I failed to wash clean, into something interesting. I decoupaged it using so called Sospeso Trasparente technique (or maybe that's just this one company manufacturing products for this technique?) - it is just that I adhere napkin image to acetate, cut out and warm over candle, then shape into necessary shape using some wooden embossing stylus and, in my case - mouse pad. The result is somewhat glass like and transparent, so it actually feels like the bottle was made that way, rather than decoupaged. Too bad that it isn't possible to actually see the 3D glass like effect in photo, but in real life it is very nice. Finally I managed to make something for my loved Color Room as well. And I'm even more happy that I managed to make this layout in compliance with Scrapbookers Anonymous recipe to make at least one stamped patterned paper and three embellishments. 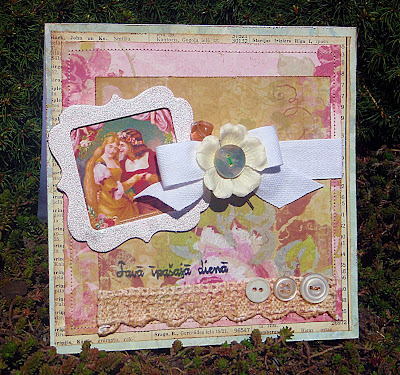 This layout features an official photo from photo studio with me, my husband and our daughter Aleksa.I used two flowers and one vines stamps that I have made myself. For the background I painted some craft card with gesso and randomly stamped flowers with Dusty Concord Distress ink using first and second generation impressions. 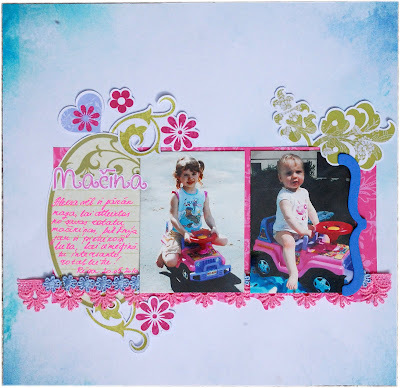 I did this also to non gessoed craft paper for the paper behind photo. 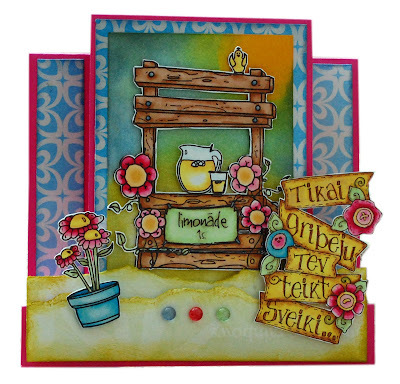 My first stamped embellishment was this vine border stamped with Barn Door Distress ink and slightly inked with Tea Dye. I decided that picture looked too glossy for this kind of layout, so I sanded it, especially edges of it. 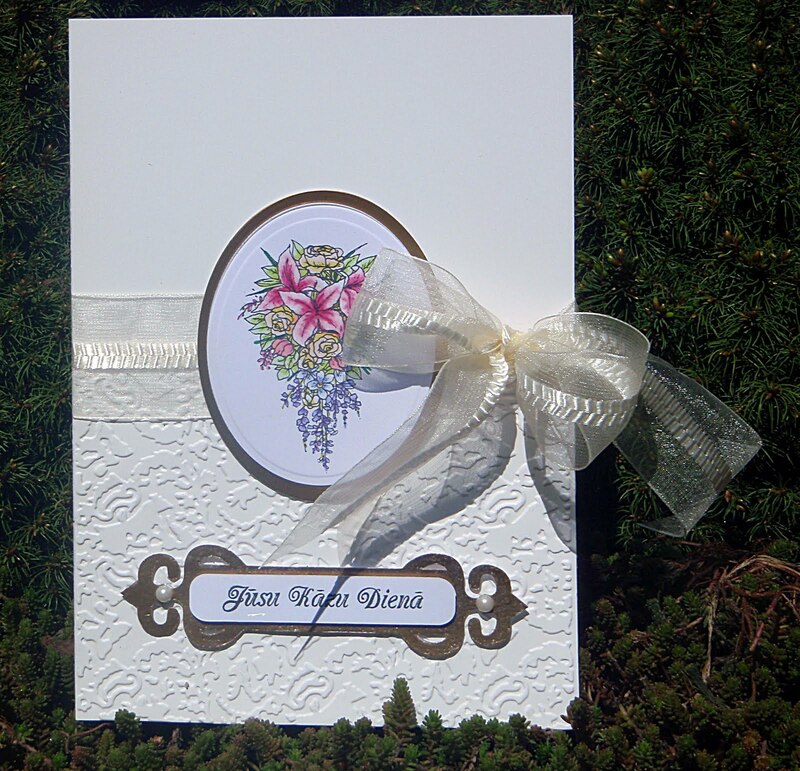 Next I stamped flowers with Barn Door ink on pink cardstock and Dusty Concord ink on craft card. Then I cut them out and layered. Flower center is accented with Viva liquid perls. 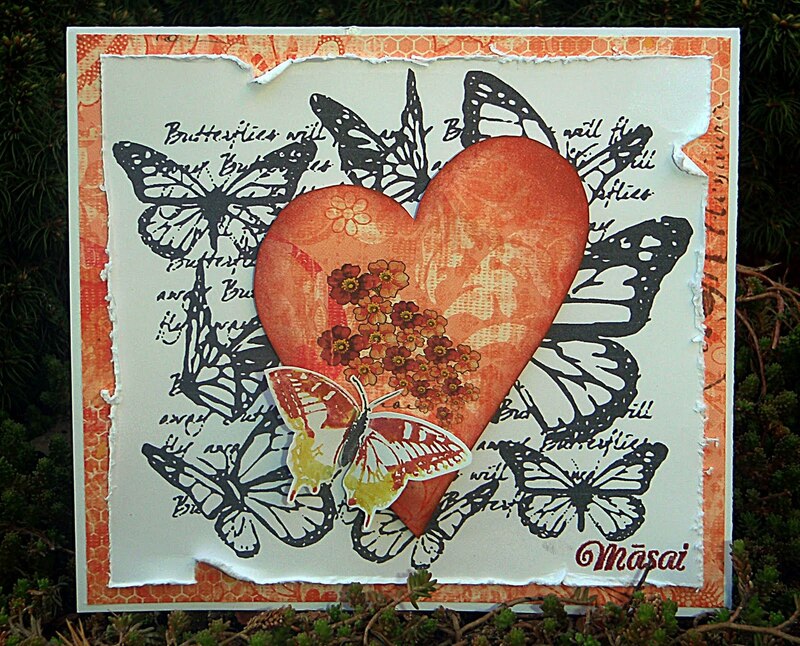 I also added die cut leaves with Sizzlit die from Tea Dye inked paper and inked edges with Barn Door ink. As my second project for my Palette #5 I made this fun layout. All elements are from My Little Yellow Bicycle Zinnia collection, thou the green label was scanned, enlarged and then reprinted to fit the area. I also printed my both background papers. Added two laces from mystash and a printed title. Journalling says: "Aleksa is still too little to let go of her toy car, but Emilia is grown enough to try this new exciting thing. Riga 20.06.2010." and it was written with pink Gelly Roll pen. 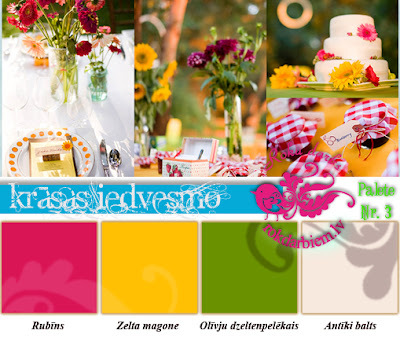 It is Monday and sort of the first Monday of the month (even if it's still May :) so it is time for my own palette posted in my Latvian crafting portal http://www.rokdarbiem.lv. This time I liked these colors so much that I made three very different projects and wanted to do some more, but instead chose to make some projects for other challenges as well. First I created this zig-zag card, for witch the inspiration came from High Hopes stamps blog tutorial of how to make this card. I even used their sentiment stamp only I substituted English words with Latvian. The original sentiment says: "Just wanted to say hello...". All other stamps are from Unity Stamps. For this card I used pink cardstock and two printed patterned papers. Images were colored with ProMarkers: Cardinal Red, Carmine, Cerise, Baby Pink, Mustard, Lemon, Marsh Green, Meadow Green, cocoa, Caramel, Tan, Petrol Blue, Ice Gray 2, Aegean, Duck Egg and Blender. Then background of the lemonade stand was inked with Distress inks - I think they were Tumbled Glass, Faded Jeans, Scattered Straw, Crushed Olive, Mustard Seed and Dried Marigold. For some final touches I added three dew drops. It is time for another colour palette for all Latvian crafters. This palette is due 29th of May, so there's still plenty of time. 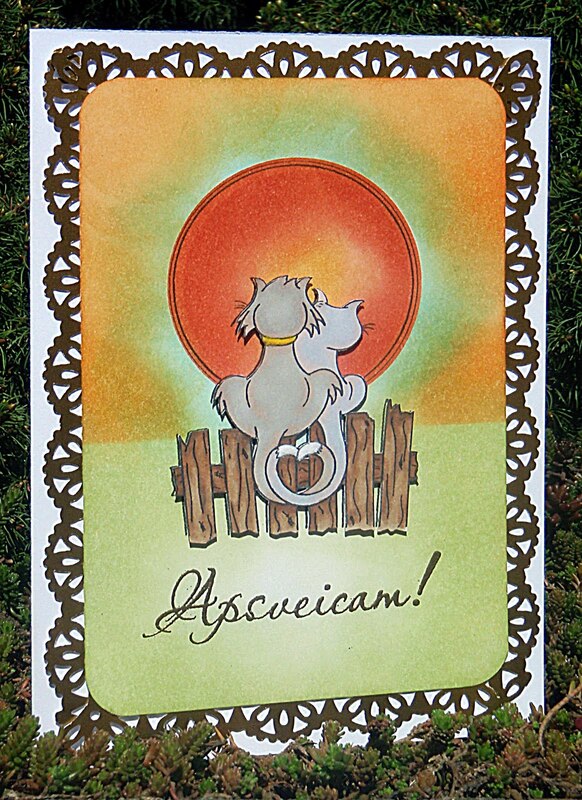 I used plain brown cardstock and painted stripe with Stamperia acrylic paint. Little spraying with Ranger's Meadow Color Wash and lots of branches die cut from K&Company Susan Winged collection patterned Paper. Woodware paper flowers and buttons - white ones were coloured with ProMarkers as I didn't have green ones. 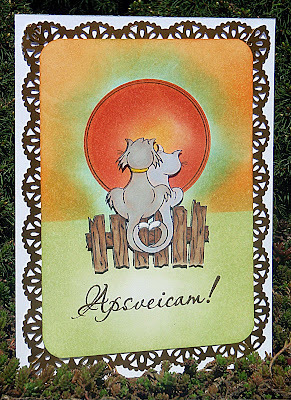 Title was die cut with my SDSilhouette from plain cardstock and spried with Meadow and Butterscotch Color Wash. I had this idea for some time in my head but just had no time to make it, until today. It didn't turn out exactly as I? planned, because I seem to be unable to align normally stamps with just glue on them and sentiment embossed somehow wrongly, but anyway I just wanted to show my idea. I stamped this damask pattern with Essential Glue Pad and then used different Martha Stewart Glitters on each row starting from sterling for the first row and turquoise for the upper one. You already know that I like once in a while just sit and colour different images, so one day when there were no electricity in our home (a very long story...) I coloured these two images with ProMarkers. And now it was time to make them into cards. Again I used layouts from PaperCrafts Inspirations magazine. Both cards have K&Company papers along with my own printed ones. 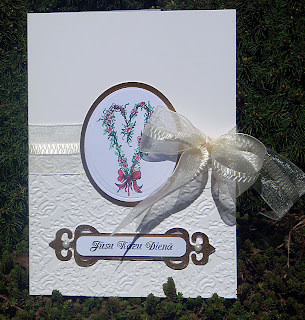 All shapes were cut with Nestabilities dies and scalloped scissors. 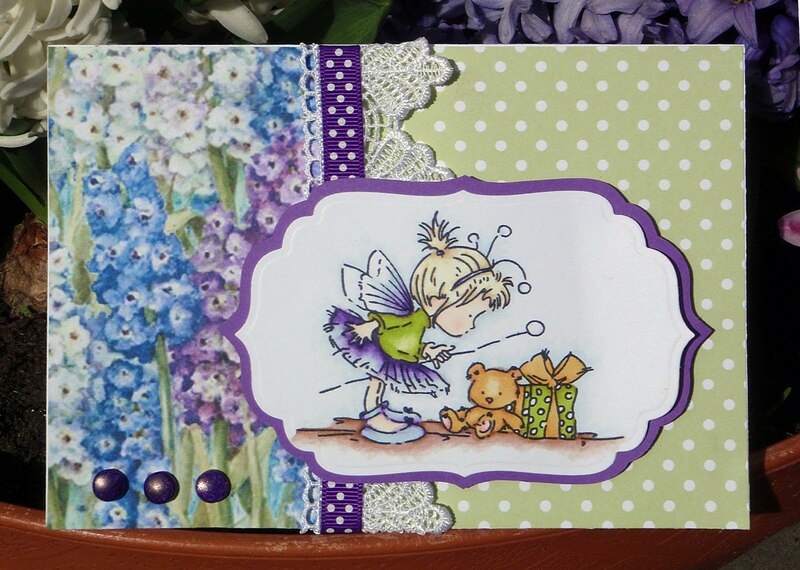 For the fairy card I used lace and ribbon from my stash and large Dovecraft brads which I coloured with Aubergine ProMarker. 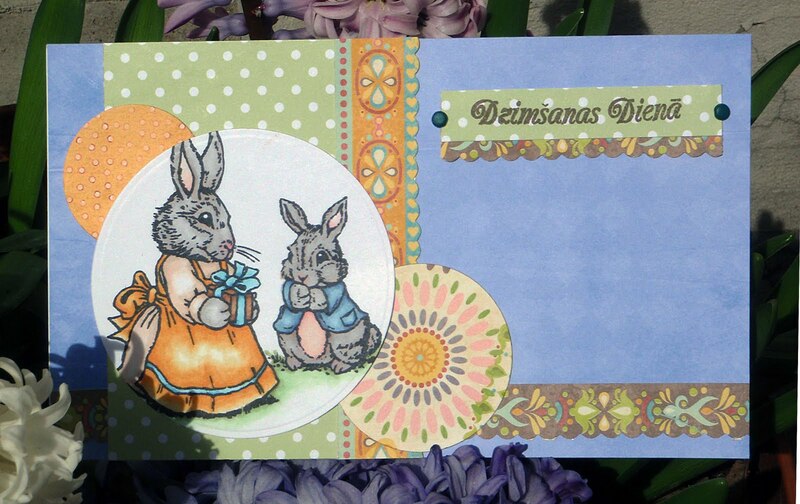 In Latvian I titled this card - She was born on 6th of May and I named her Ieva. As my sister was born on 6th of May and I actually talked my parent into naming her Ieva, even thou I was just 5 years old. This card is actually a cardlift from Katjuska's card that I planned to make for my wedding series, but it turned out pretty nice form my sisters card. thre's not much I can tell about this card as I don't know what are those papers and stamps. Only that sentiment stamp says For Sister. 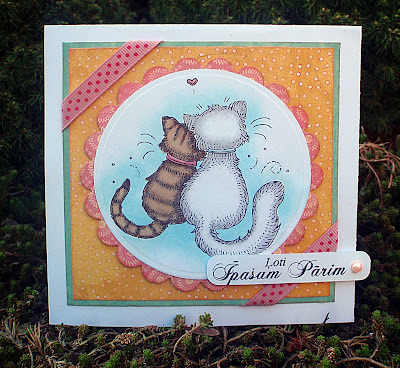 I had coloured this card with ProMarkers along with the first cats image on these wedding series, but somehow just couldn't place it on the actual card. Then when the latest PaperCrafts Inspirations magazine came into my hands, I saw the card layouts made by Angela Poole and realized that this interesting layout is just perfect for my cats. Papers are from K&Company again and polka dotted ribbon from eBay. Sentiment says For A Very Special Couple. I really start liking white embossed surfaces for a really elegant look, so I thought that it would suit wedding cards just perfectly. I used very glossy cardstock and embossed haf of it with Tim Holtz Damask Texturz plate. Then I added this big organza ribbon and gold oval for the topper. The problem was to think what to put on it as my focal point. I die cut Fancy Tags shapes from white cardstock using my SDSilhouette as I actually don't have these dies jet, but I guess they will be my next purchase. I also made them slightly bigger than they are in the real life. 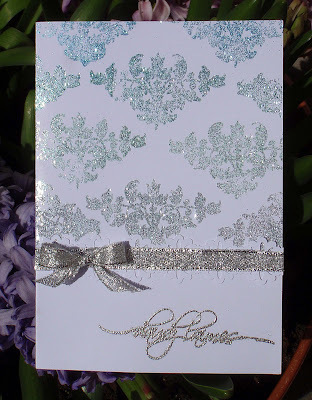 Then I embossed tag with gold embossing powder, because I wanted this golden look, but my gold cardstock was to heavy for my Silhouette to cut it. 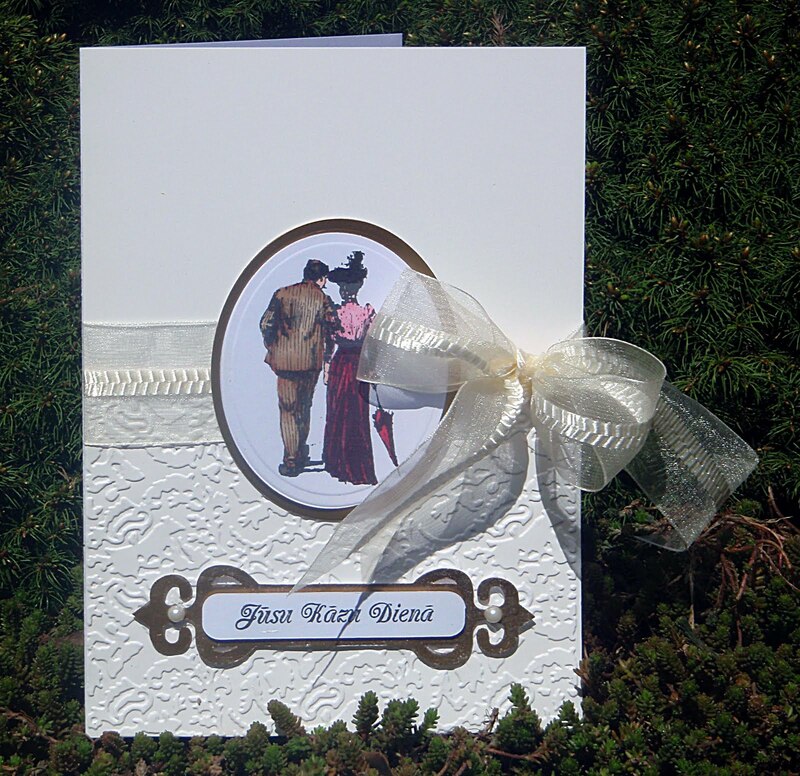 Sentiment says On Your Wedding Day and was complemented with two creamy self adhesive pearls. this heart shaped wreath. All of these images were coloured with ProMarkers and adhered with repositionable glue so that my client can choose which one she likes best. And she chose the Victorian couple. I'm still trying to make something Beatriz Jennings style, as she really is one of the best cardmakers I can think of. 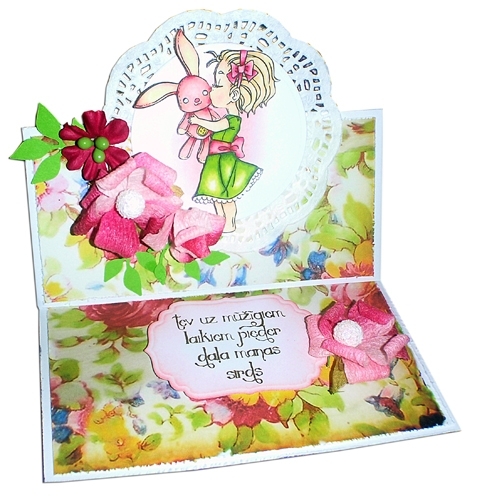 Her style is the one I like best, so I really would like to make cards as pretty as hers one day. I think that this cards is one step closer to may goal. For this card I used various K&Company patterned papers, paper from a antique phone book, chipboard frame covered with embossing powder and glitter, picture from collage sheet I printed on my printer (featuring Romeo and Juliet), white seem binding, paper flower, head pin with beads, buttons, floss coloured with Copics, crocheted lace I inked with Tea Dye Distress ink and a sentiment stamp saying On Your Special Day. This wonderfull cat couple stamp is adorable. I coloured it with ProMarkers, but background and sun was inked with Distress inks. I also added white flock to the tips of cats tails for some fun detail. 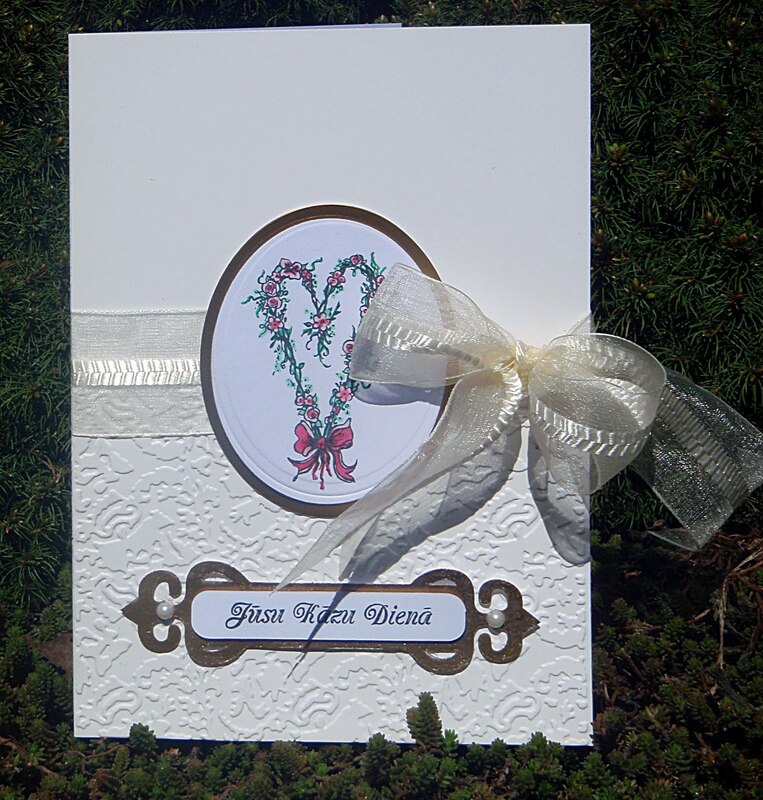 Sentiments says Congratulations and is heat embossed with gold powder. Frame is also made from gold card. 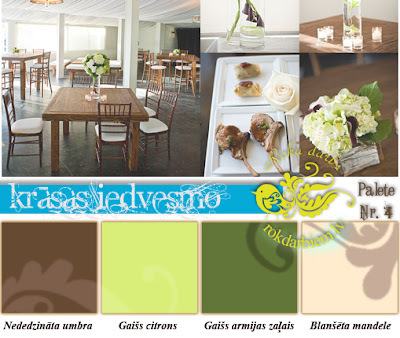 In my hard attempts to introduce Latvian with all that's cool in the world, I decided to make my own colour challenge. 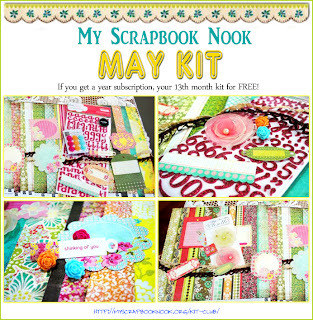 This colour challenge is different from the ones we have all used to, because this is not about cardmaking or scrapbooking but about all crafts you may possibly imagine as long as it is possible to incorporate the given palette colours in your project. This scrapbooking page was made with three patterned papers that I printed on my new A3+ printer. I simply love it - it's Epson Stylus Office B1100. For the ledger paper I used Woodware big edge punching system, which I actually dislike, but as I do have it, I have to use it... 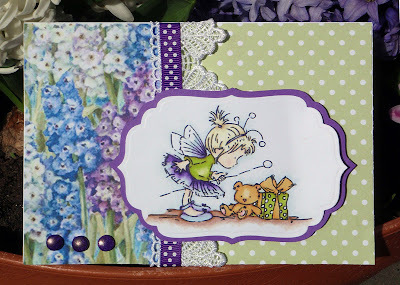 Flourishes stamps are from Viva and I stamped them with also Viva embossing paste for additional texture on my layout. Other two stamps are of my own make and first one is a definition stamp of doughter and the other one says I love these girls. Corner embellishments are lots of leaves from Sizzlit die Flowers, Branches & Leaves Set + rose and pearls from a cake packaging I bouht in Italy just before Chrismas. Next it's a glass plate with reverse decoupage. 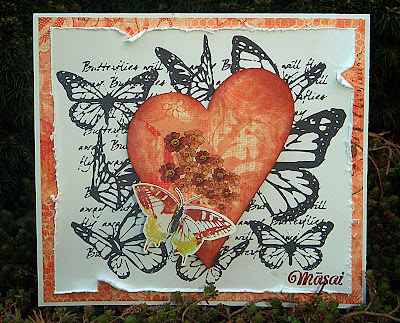 I used just a cutout from stamperia decoupage paper and Stamperia acrylic paints, varnishing all with Stamperia Vetrifying lacquer.